These L.A. Burgers are topped with a creamy avocado relish that packs a subtle heat. When paired with pepper jack cheese, these are burgers with a flavor punch. The original recipe calls for watercress and Monterey Jack cheese but I substituted with baby spinach and pepper jack cheese instead since it's what I had on hand. Either way, the burgers are delicious and is a great change of pace from the usual standard burger toppings. 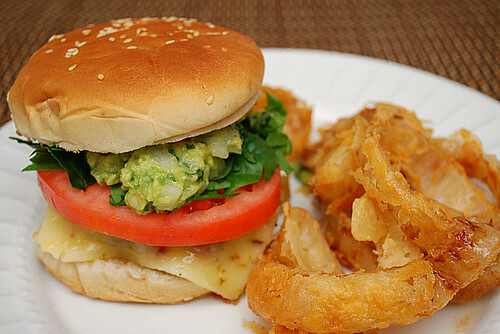 I served these burgers with buttermilk onion rings. To make the avocado relish, combine the ingredients until fully mixed together. Season with salt and pepper and set aside. Cook the burgers, using the oil and topping each one with pepper jack cheese and a basting cover during the last minute of cooking. Place the burgers on the bun bottoms. Top each with a slice of tomato, spinach and avocado relish. Cover each burger with the bun tops and serve immediately. After living in LA, I heart avocados! This looks absolutely delicious! !